1. Click here to visit the Catalog Spree site and click “Signup With Facebook” underneath “Sign up for Catalog Spree for FREE.” Their site is running slow so you may have to wait for it to load or refresh the page. 4. 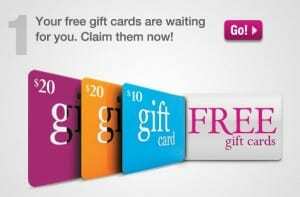 Their site is running slow, so wait for them to load or refresh the page to see your gift cards. Then click “Get My Gift Cards” and fill out the form on the next page. 5. Done! Check you email for your unique codes. No email, alas. I smell scam. 6 hours, still no email. Hey Calthine. My email came right away. Are you sure you allowed their app? It asks for a lot of personal information they’re going to share. Not gonna happen. I got the e-mail right away but only two gift cards (no cookies for me). As for sharing of my info, it’s catalogs I get catalogs in the mail all the time I didn’t sign up for.